The arctic ice volume recorded last fall was the lowest ever since the first satellite reports were introduced, according to data furnished by a new study which used complicated weather modeling, ocean observations, submarine data, and space-age monitoring. The melt season for Arctic sea ice climaxes each September or October, and many people closely track the satellite generated reports and analysis of sea ice extent by the National Snow and Ice Data Center. This year’s ice volume quite probably will be even thinner than the one reported last year, the current record holder for all time lows, since current data indicates arctic ice volumes plummeting a more rapid pace than last year. 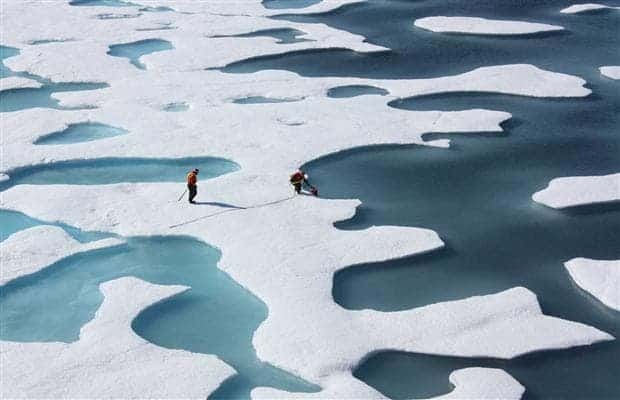 Interestingly enough, as of July 31, this year, the last time numbers were crunched and posted online, the volume of sea ice appeared to be about 2,135 cubic miles — more than 50 percent lower than the average volume and 62 percent lower than the maximum volume of ice that covered the Arctic back in 1979, researchers said here. Those are very frightening figures, one which could lead to massive sea level rise and weather disruption in the near future. Called “Uncertainty in Modeled Arctic Sea Ice Volume”, the highly technical discussion recently published in the Journal of Geophysical Research tackles the current arctic melting crisis and offers insight on how scientists calculate, monitor and reality check the ongoing volume of sea ice in the Arctic Ocean using their Pan-arctic Ice Ocean Modeling and Assimilation System.